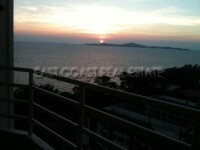 This is a very spacious 115sqm, 1 bedroom, corner unit situated in one of Jomtiens most popular buildings. Its great location, large communal swimming pool and spa on site make this project very popular indeed. This unit is great for someone only needing 1 sleeping room, but wanting more space for day to day life. With a huge open plan living room and 2 usable balconys you can relax or entertain in comfort. It has been owner occupied and extremely well maintained. Being a corner unit, there is lots of natural light in the room, fitted kitchen and wardrobes and a large en suite bathroom with 2 doors. All amenities are only a few minutes away and include Jomtien Beach, international restaurants, bars and nightlife, laundry and local taxis. It is available for sale fully furnished with title deed held in Foreign name. Tax and transfer fees will be split 50/50 between seller and the buyer.